There's something about having kids over for a play date that makes me want to bake! The more play dates we host at our house, the more I bake... which is fun, but means I need to share the goodies with the parents when they come and pick up their kids! So, last weekend while My Oldest was playing with his friend from down the street, I decided to poke around the pantry to see what I had in there. I found a bag of Reese's peanut butter chips. I remembered my neighbor telling me that he would love a cookie that tastes like a Reese's Peanut Butter Cup. So, I went searching for a chocolate cookie recipe that used the PB chips. I found one, and since I knew I'd need the oven sooner rather than later for the pizzas we were making for lunch I decided to bake the dough into a bar cookie instead of drop cookies. These bar cookies were spread in a jelly-roll pan rather than the usual 9x13 pan which means a thinner cookie which means a shorter baking time! These cookie bars were so gooey and chocolatey when they came right out of the oven! They were a huge hit with the kids and the neighbors... I hear that they made it into the lunchboxes for dessert on Monday! I should tell you that they are best eaten by the 2nd or 3rd day since they start to dry out a bit after that - even with keeping them in a sealed container (or perhaps someone has been sneaking a few and not closing the container.... hmmmmm... I think I can figure out the culprit with a bit of interrogation!). You can find the recipe HERE. Go ahead, indulge your peanut butter and chocolate craving... I dare you! Ya know, when your restricting yourself to sweets once a week, seeing photos like this just can kill you! lol. They look delicious Patsy! My favorite combo...chocolate and peanut butter. This would be a hige hit in my house. I may have to surprise my daughters with this one! Mmm, they look so fudgy, it's no wonder they were a hit! Resese is one of my fav American candies... I love when they come out with the easter version.. the eggs? 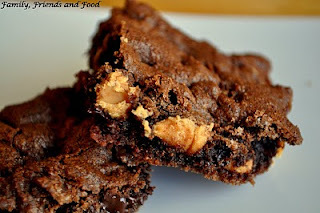 The fact that you made it into a Brownie bar....all the more delish.